Ashok Raiji has a B.Sc. in Chemistry from the University of Bombay and a B.S. and M.S. in Mechanical Engineering from Texas A&M University. He is a registered Professional Engineer in 25 states and a LEED Accredited Professional. He is member of the Board of Directors of the American Institute of Architects (AIA) New York Chapter. 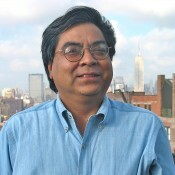 Professor Raiji lectures frequently on Sustainable Design and has provided technical advice to the National Building Museum on the subject of Sustainability. Professor Raiji teaches ARCH 134, Environmental Technology I. Professor Raiji has contributed to international energy journals and was a contributing author to the National Building Museum’s Big and Green – Sustainable Architecture for the 21st Century. He has been the Engineer of Record on numerous award-winning projects including the Kresge Foundation Headquarters in Troy, MI (LEED Platinum), the Frick Chemistry at Princeton University, Columbia University’s Northwest Corner Building in New York and the new Delta Airlines terminal at JFK Airport. He is currently working on a new international airport in Mexico City and a significant resilience project for New York City Housing Authority in the aftermath of super storm Sandy. View Ashok Raiji's CV here. • Expansion/renovation received USGBC’s LEED® Platinum rating. • New 19,500ft2 building and sustainable renovation of 19th century farmhouse and barn. • Sustainable strategies include geothermal heating and cooling. The Kresge Foundation has endowed non-profit organisations with capital grants and programme support for more than 80 years. In 2003, the environmentally-conscious foundation inaugurated a programme to encourage sustainable building by non-profits and embarked on a sustainable renovation and expansion of its headquarters. The foundation renovated its existing buildings and built a new, highly efficient, low-energy building to house its expanding operations. Employing both low and high-tech methods, the new building uses considerably less energy than a standard building of similar size. The new building is oriented with its longer sides facing north and south, providing maximum natural light. Strategic sun shading helps to regulate interior temperature all the year round. Taking advantage of the Earth’s built-in insulation properties, a large proportion of the new building is embedded in the ground. The facility employs a geothermal system for heating and cooling. Water circulates through a system of wells sunk to a depth of 400ft, where the earth remains at a constant 55 degrees Fahrenheit. From this constant temperature, water can be more efficiently heated or cooled according to the season. Additional sustainable strategies include a series of green roofs, landscaping with drought-resistant native plants, stormwater runoff management and interior water conservation and reuse systems. · 101-acre park for a new city built on reclaimed land. · South Korea’s first seawater canal. · Collaborative effort coordinating the work of more than 10 Arup offices worldwide. Central Park provides a multifunctional oasis for the Songdo International Business District, a new city built on 1,500 acres of land reclaimed from the Yellow Sea. Arup’s scope for the park included a major seawater canal; a remediation strategy to provide a plantable landscape on a platform of sea-dredged soils; sustainable irrigation via rainwater harvesting; pavement analysis; drainage, utility, and lighting design; a three-level underground parking garage; and two footbridges spanning the canal. We have also been heavily involved in a number of additional aspects of the New Songdo City development. The canal system required a highly creative, complex design process. In addition to the difficulties associated with building South Korea’s first seawater canal, the sheer scale of the waterway posed significant challenges of its own. In addition, the multiple intended functions of the canal – transport artery; waterfront development space; natural cooling mechanism; biodiversity facilitator – involved often-conflicting drivers such as transport, sustainability, and water quality and ecology. We searched throughout the firm's global offices to bring together the individuals with the most relevant experience. The resulting group included specialists in civil engineering, hydraulics, hydrology, maritime engineering, ecology, geotechnics, structural engineering, transport planning, bridge design, and MEICA (mechanical, electrical, instrumentation, control and automation). Two footbridges, both designed by Arup – Mountain Strolling Garden Bridge and Park Path Bridge – cross the canal. The architectural forms were developed to match the flow of the park and the masterplan vision. The curvature of the bridges echoes the scalloped roof of the convention center to the east. The tilted arch and deck profiles were kept low to maintain pedestrian visibility into the park. Structural arches extend from below to above the decks, providing walkers and cyclists with a constantly changing view as they cross. We sculpted light around the bridges' key features to form a soft glow for pedestrian movement at night. The lighting scheme continues along the footpaths throughout the park. Our sustainable irrigation system responds intelligently to Korea's extreme weather patterns in order to conserve water. Underground storage elements can capture approximately 190,700ft³ of rainwater falling within the site boundary during the wet summer months. Rainwater is stored through the dry winter, when water demand is low. In the spring, when temperatures rise, the water is used for irrigation. We reduced irrigation demand as much as possible through a planting scheme that favored species with low water needs. The ability to thrive in a harsh environment was also key to landscaping selections. To protect the landscaping from saline groundwater in the reclamation fill, Arup introduced a capillary break layer separating growing medium from the underlying reclamation fill. Arup carried out a CFD (computational fluid dynamics) study to validate its mechanical ventilation system design for the parking garage. The results confirmed that the design would provide safe air. The Princeton University Frick Chemistry Laboratory is an energy-efficient research and teaching facility. Specialised laboratory fume exhaust systems provide a safe environment for researchers while saving energy. All structural, mechanical, electrical and plumbing systems developed with Building Information Modelling (BIM). A model of energy-efficient research space. Our scope for the 265,000ft2 research and teaching facility included structural, electrical, mechanical, plumbing, and fire protection engineering, as well as façade, lighting and acoustic consulting. Consisting of two four-floor buildings connected by a full-height glazed atrium, the laboratory is a key element of the University’s natural sciences neighbourhood expansion. Arup is also working on a neuroscience facility for the development. Our sustainable strategies allowed the building to achieve a 30% energy savings over a code-compliant baseline facility. One of the primary challenges facing the team was meeting stringent energy efficiency goals while providing researchers with laboratory fume hoods. We accomplished this by specifying high-efficiency hoods equipped with occupancy sensors and automatic sash closers. A cascade system captures air from the offices and atrium replenishes laboratory air exhausted through the fume hoods. Additional sustainability measures include a highly insulated facade, high-efficiency glazing and optimised solar shading. A chilled-beam cooling system and a heat recovery system provide a comfortable environment while using fewer resources than standard temperature-control methods. 216 rooftop photovoltaic panels generate energy while providing shade for the atrium below. A rainwater collection system provides water for toilets and irrigation. There is also a building monitoring dashboard in the atrium that displays information about electricity and water use. Daylight provides much of the building’s lighting needs. Energy-efficient electric lighting controlled by sensors that monitor occupancy and daylight levels make up the balance. Arup’s acoustic consultants minimised vibration in sensitive laboratory environments and optimized sound quality in the auditorium, classrooms and atrium. Arup developed Frick Chemistry Laboratory’s structural, mechanical, electrical and plumbing systems entirely using 3D modelling. Structural design of a high-rise building that functions as a bridge, spanning an existing gymnasium. Integration of mechanical, electrical and plumbing infrastructure for future flexibility of interdisciplinary research. Creative engineering solutions to achieve architectural goals of openness, transparency and connectivity. Reducing laboratories' energy consumption to meet sustainable design targets, achieving LEED® Gold certification. Arup's engineering and consulting services for a high-rise science building helped Columbia University realize its goal of forging stronger connections with the surrounding city. We provided full mechanical, electrical, plumbing and structural engineering services, as well as IT/communications, fire, security, sustainability, acoustic and lighting consulting. To cut costs and avoid disruption of university services during construction, Columbia opted to build around an existing gymnasium. The new tower therefore effectively needed to function as a high-rise bridge spanning over the gymnasium seven stories off the ground. After selecting a chevron structure for the core of the new building, which rises over the gym, Arup experimented with hanging the remainder from the chevron rather supporting it from the ground up. Comparative structural analysis demonstrated that this configuration actually performed better than the standard option. The hanging structure freed up the lower floors to be used for public open space without the need to build expensive, unsightly transfer structures. This enabled two large, highly transparent spaces – a cafe and a library – to be situated close to the ground, providing clear points of connection between campus and city. The joint venture between Arup and Skidmore, Owings & Merrill LLP, known as ArupSOM, were delighted to attend the grand opening on 24 May 2013 of the new Terminal 4 for Delta Air Lines at John F. Kennedy International Airport (JFK) in New York City. The new $1.2b terminal complex consolidates Delta’s operations at JFK, allowing the airline to move out of aging facilities in Terminal 3 and improve the passenger experience for the estimated 11m Delta passengers who will pass through every year. ArupSOM was the designer of the original Terminal 4 building, which opened in 2001. This latest project includes the expansion of Terminal 4’s Concourse B and the addition of new security facilities. The redevelopment also features expanded shopping areas, the new 24,000ft2 Delta Sky Club, and new domestic baggage claim facilities to speed the transfer of passengers from international to domestic flights. SOM, which has a long and productive history of work at JFK starting with the 1958 completion of the International Arrivals Building, was the lead planner and architect of the project, while we acted as the building and civil engineer. This newest expansion continues to fulfill the original master plan for the terminal by strengthening support of operations within the context of the terminal’s central column-free space, with its plentiful views and natural light. We provided a full slate of services on this project, including structural, mechanical, electrical, and plumbing engineering; civil engineering; acoustics consulting; fire and life safety code consulting; geotechnical engineering; information technology and communications consulting; security consulting; integration management, and commissioning. SOM was the lead planner and architect for the Terminal 4 expansion. Mexico’s President Enrique Peña Nieto, in the presence of the Governor of the State of Mexico, government ministers, the Mayor of Mexico City, Lord Foster and Fernando Romero, announced that a collaboration between Foster + Partners, FR-EE (Fernando Romero Enterprise) and NACO (Netherlands Airport Consultants) has won the international competition to design Mexico City’s new international airport. At 470,000 square metres, it will be one of the world’s largest airports. Conceived with Foster + Partners engineering team, the project revolutionises airport design – the entire terminal is enclosed within a continuous lightweight gridshell, embracing walls and roof in a single, flowing form, evocative of flight. Grimshaw’s Qatar Civil Aviation Authority (QCAA) Headquarters will be constructed at the gateway to New Doha International Airport City, as part of a world-class aviation infrastructure project. The building will be home to the QCAA’s five key divisions including Air Transport, Air Safety, Air Navigation, Joint Services and Meteorology. The departments are housed in a sequence of discrete office ‘petals’ clustered around a common curved atrium, making for a highly efficient organisational arrangement. The new building is poised on top of a podium which offers shaded strolling and break-out spaces for visitors and employees via a blend of hard and soft landscaping, and connects pedestrians to an adjacent transit system. Sunken gardens in the podium provide daylight, vegetation and wayfinding for the parking levels below. The QCAA headquarters has a high performance exterior envelope customised to the building’s unique shape, location, solar orientation and Qatar’s climate. Filtered daylight will suffuse the building whilst direct solar penetration is controlled by exterior shades and the placement of insulating wall panels and limited areas of glass. The building’s skin features cast ceramic panels and the roof is constructed from high-albedo ceramic tiles to protect from the intense overhead sun. Sandy Resiliency & Renewal Program.